The non-toxic and biodegradable bathroom cleaner removes mineral based soils, soap scum and hard water stains typically found on hard bathroom surfaces. The cleaner is non-caustic, non-flammable and formulated without VOCs that can adversely impact indoor air quality. The concentrated formula dilutes at 1:20 for great value. It meets the Green Seal™ GS-37 Standard, including reduced health, safety, and environmental impact of formulations as well as product efficacy requirements. It also complies with LEED green building requirements and environmentally preferable product purchasing programs in place throughout federal, state, and municipal governments. 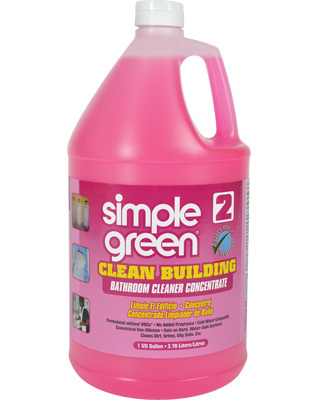 Simple Green Clean Building Bathroom Cleaner Concentrate is perfect for use in schools, universities, government facilities and other LEED Certified buildings that require environmentally preferable product purchasing. It is specifically formulated for removing mineral based soils, soap scum and hard water stains typically found in bathrooms, locker rooms, spa facilities and more.